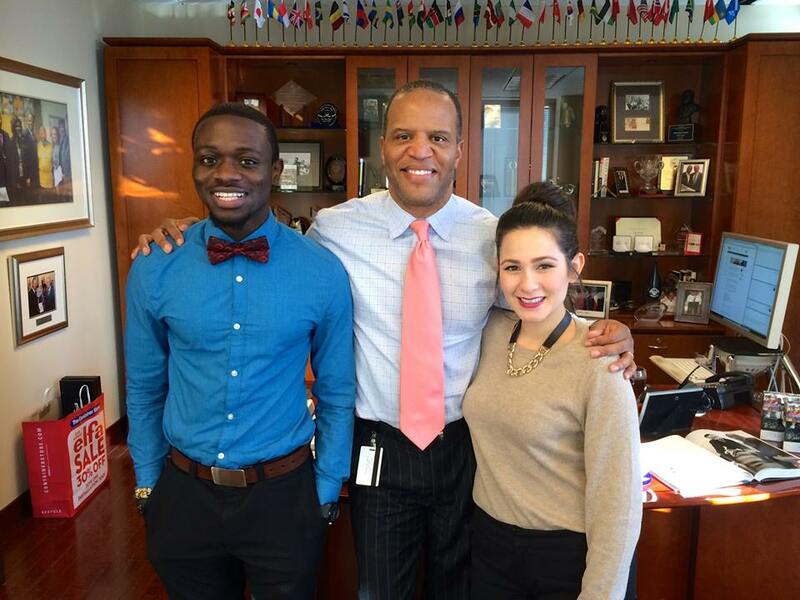 Facebook/Operation HOPE John Hope Bryant (center) with Office of the Chairman Fellow Eddie Minta (left) and OOC Intern Maria Martinez (right). Last year, 45 million Americans, or 14.5 percent of the population, were below the poverty line. While declining, that percentage still represents a life-defining crisis that hinders millions. Furthermore, the 'Teetering Class,' or Americans who are essentially surviving paycheck to paycheck, constantly risks falling below the poverty line as well. But one movement, Operation HOPE, aims to change lives through financial dignity. Operation HOPE is a leading nonprofit that aims to empower individuals through financial literacy in a bid to eradicate poverty. John Hope Bryant established Operation HOPE in the aftermath of the Rodney King riots in South Central Los Angeles in 1992. Bryant, an entrepreneur since childhood, teaches these methods through the Silver Rights Movement, a series of books that tackles important subjects facing Americans today. His latest book, How the Poor Can Save Capitalism, delves deeper into these topics.With a focus on individuals of all ages, Operation HOPE aims to keep goals high through attainable methods. The first goal of Operation HOPE is to educate. "We have to demystify the economy, first and foremost," explains Bryant. "Replace the myths with facts. The facts are very inspiring." Additionally, the movement strives for results that are seen by the individual and community--something Operation HOPE sees as a key for the movement. "People need to see change right in front of them," explains Bryant. Operation HOPE's major initiative is Project 5117, a four-step approach to educating and empowering all ages from middle school up. It's supported by the U.S. Consumer Financial Protection Bureau (CFPB), the FDIC, the American Bankers Association, President Bill Clinton and SunTrust Banks, to name just a few. Project 5117 is a large, yet feasible project that hopes to empower five million young people with financial literacy education, as well as HOPE Business In A Box Academies in 2,000 of "the worst schools in America," a distinction Bryant does not agree with. Gallup has formed a 100-year partnership to track the progress of each school from fourth to twelfth grade, dubbed the Gallup-HOPE Index. Each school will need to invest $10,000 per year for the project to operate. One million of the students will then be chosen to become entrepreneurs to start their own business for under $500. They are chosen after giving two-minute pitches to their schools. "Think Shark Tank for kids," explains Bryant. The students will receive their seed money in a bank account, as well as mentorship from local business leaders. That's when the change takes effect in the child. "At that point, the endorphins are kicking in the right side of the kid's head," Bryant elaborates. "By then it doesn't matter if they become an entrepreneur or not. They take their lives back and become leaders." For the other four million students, Operation HOPE strives to provide graduating students with internships in prominent companies to introduce them to the professional business world. Furthermore, Operation HOPE will add 1,000 HOPE Inside units spread throughout the country, which will serve as certified financial literacy centers. "We're going to become the national private banker for the working man for the first time in America's history," states Bryant. Much of the movement derives inspiration from Abraham Lincoln's Freedman's Savings Bank and Dr. Martin Luther King Jr.'s work at the time of their assassinations. Lastly, Project 5117 hopes to educate individuals to achieve a credit score of 700 or greater, a goal they intend to achieve through the courses at their HOPE locations. With that, Operation HOPE aims to motivate entrepreneurs to invest in their communities by owning local businesses that stimulate positive spending and employment, as well as real estate investment. Bryant points to the post-World War II Marshall Plan as the "bold, audacious move" that spurred American trade after rebuilding the Axis nations. "We need a Marshall Plan for today," he elaborates. "I call it 'The HOPE Plan." A key focus of the plan is on small business. Bryant cites the confusion people have when looking for employment. He points to the low number of businesses that employ over 10,000 employees. With that in mind, he emphasizes that small business is the way to go. Whether it's creating a business or finding employment in one, the creation of one million small businesses per year will help boost the GDP and economy of the area. "Young people are idealists and want to change the world," he says. "You can't have a movement in the world without young people." This includes getting at least five percent of communities to become role models, which will help stabilize their neighborhoods through work and contributions in the community. "You don't need a majority to change the world. Hope is so powerful. You can have a minority that's so focused and targeted it can change everything." Operation HOPE and Bryant understand that they're in for a massive undertaking--but even with that knowledge, they remain undeterred. Like former home run king Hank Aaron, you have to take a swing to connect with the ball. As for Bryant? "I'm going to swing this bat everyday," he says.